As Singapore is constantly reinventing itself, this book is a timely publication. After all, anything on contemporary Singapore that doesn’t include the Marina Bay Sands’ iconic towers, Gardens by the Bay and the new Business District extension is hopelessly out of date. Yet, this book is much more than a round-up of Singapore’s new urban cityscapes. Rather, it traces the development of the city-state, showing how so much of the old has been retained and celebrated alongside the new. In addition to an assessment of the downtown core, chapters include an analysis of Singapore’s eco credentials as it strives to become a truly green City within a Garden; how its varied population contributes to its success (and how the various peoples came to its shores); a sober reflection on World War II and Occupation, and reminders thereof; a showcase of all things stylishly Singaporean; and finally, a short look back in time with a selection of evocative black-and-white photographs to Singapore’s early days as a colonial city. 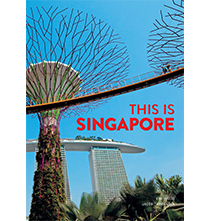 Beautifully photographed by Danish photographer, Jacob Termansen, with insightful texts by Kim Inglis, this is a must-have for anybody interested in the history and culture of Singapore.